Alumatite Door Systems are designed to provide an attractive and practical solution when maximum light and/or visibility is required. Built to withstand heavy use and high traffic using extruded aluminum alloy rails and stiles with a full width integral horizontal reinforcing truss at each pair of meeting rails. Highest quality hardware components provide years of dependable operation. 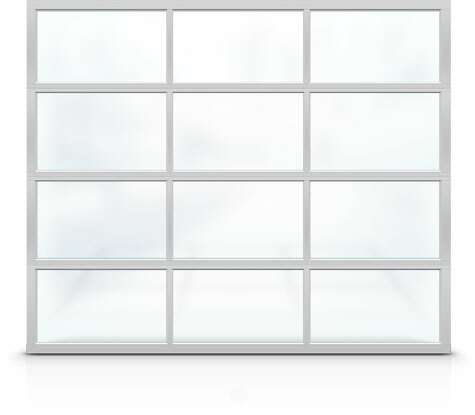 Choose from a variety of finish and glazing options or configure your door with Thermatite panels for extra strength and additional energy savings. Fabricated from 6063-T6 aluminum alloy extrusions, extrusion thickness 0.075″ (1.9mm) thick, and 0.105″ (2.7mm) thick at hardware mounting locations. Fabricated from 0.05″ (1.29mm) thick stucco embossed aluminum sheet. Clear* anodizing to AA Spec A-21 (Custom anodized colors are also available). White Duracron Super 600 thermo-setting acrylic enamel.